Brought to life by the AllSpark pulsewave released during the final battle against Megatron, Landmine is still learning what it means to be an Autobot. He is content, however, to continue his work with the humans of Sector 7, even while Ironhide trains him in the finer points of robot combat. He enjoys the excitement and intrigue of working as an agent in a super-secret organization. Knowing that what he does not only keeps the humans safe, but also protects his fellow Autobots, brings him great satisfaction. Prelude: Landmine might just be one of the most underestimated toys of the Movie line. Prior to coming out he was called things like "toaster face", "hockey goalie", "strange", and God knows what else. His alternate mode seemed harmless and far from special, while his robot mode appeared unstable and shaky. Just goes to show how wrong first impressions can be. Landmine is simply the best toy of the entire Movie line of toys. For my review I had the Takara version of Landmine, which included a small Allspark replica. 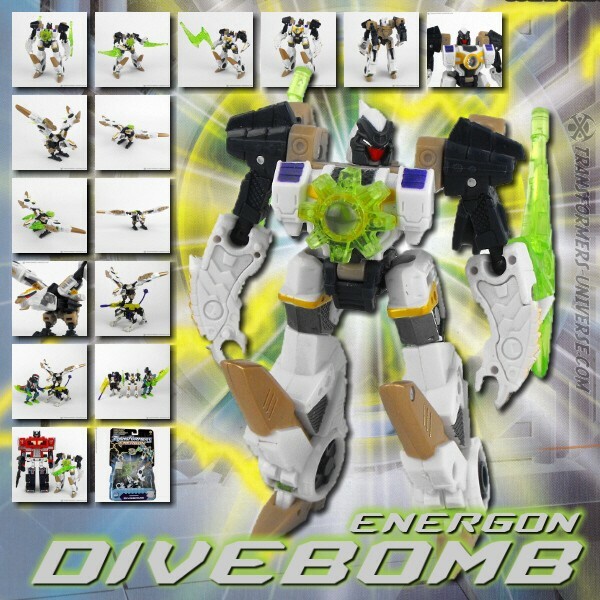 I should also mention tha the Takara version features a higher quality plastic and a slightly darker colour of green. Alternate Mode: Landmine transforms into one of the Chenowth DPVs we saw in the Movie and is highly detailed. Apart from fuel tanks, armour, and US-Army-typical style elements we have a high-caliber gun on top of Landmine, which can twist a full 360 degrees around and 120 degrees upwards. Landmine makes you think that this might just have been the last figure developed for the Movie line, so the designers poured in all their skill and love into this one. The eye for detail that was applied here is incredible. Every wheel has a seperate suspension complete with shock absorbers, he's the only toy of the Deluxe class featuring seats, an engine hood, double roll bars, as well as an armoured and riveted windshield. If he were of Alternator-size and made from metal, I think he'd be one of the best toys ever made, bottom line. Robot Mode: Transforming Landmine into robot mode isn't difficult - the other way around is a bit harder (mostly because of the seats). The roof-mounted cannon "mutates" into a shoulder cannon, which strongly reminds me of the Predators from the movies of the same name. Landmine's facial features are hard to make out. Much like a spider he has many eyes (6), which are hidden behind a kind of face mask (much like that of a hockey goalie or a baseball umpire). The seats shift into clawed hands, which allow him to nicely grab all sorts of stuff. Looking at the hands kinda reminds me of Wolverine from the Marvel Comics. Much like Bonecrusher Landmine has the ability to deploy his rear wheels for a kind of 'Skater-Mode'. Most important of all, though, Landmine might just be the most posable and bendy Transformer I ever got my hands on. He can pull of just about any conceivable pose, be it a handstand, lying on the ground firing his gun, or a two-handed grip on his rifle. Landmine is the god of posability. Which will have an impact on my conclusion sheet below. That's not a mistake you see there, that's meant to be!